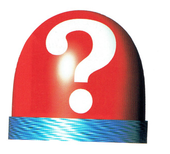 This article is about the object that appears in various games. For the level with the same name in Super Mario 64 DS, see Tower of the Wing Cap. A switch with a question mark. The ? Switch first appears in Yoshi's Story. When a Yoshi presses the ? Switch by simply jumping on it, the ? Switch disappears and a part of the level is changed briefly. As the effect expires, the switch's music will speed up. There are ? Switch Panels that also act as a ? Switch and extend the switch's time limit. A ? Switch also appears in Super Mario 64 DS. It appears in the secret level, which is also titled "? Switch" (formerly titled Tower of the Wing Cap). It serves mainly as a one-shot replacement to the original game's three ! Switches. Upon pressing the ? Switch, all ? Blocks in the game will become solid and can be broken open. Whereas the three ! Switches only filled in ! Blocks of their respective color, the ? Switch fill in all ? Blocks, as they are all the same color, red, and the ability that the player will get now depends on the character they are playing as.
? Switches later appear in New Super Mario Bros., this time with an orange color. Like the ones in Yoshi's Story, these switches change or add to an area of a level, like adding moving platforms or flipping the entire level upside down. The effects of these switches can be temporary or permanent, varying from switch to switch. They also appear in New Super Mario Bros. Wii, New Super Mario Bros. 2 and New Super Mario Bros. U with the same effects. In versions of Super Mario Maker before version 1.30, P Switches in the New Super Mario Bros. U theme have the appearance of ? Switches. Sprite of a ? Switch from New Super Mario Bros.